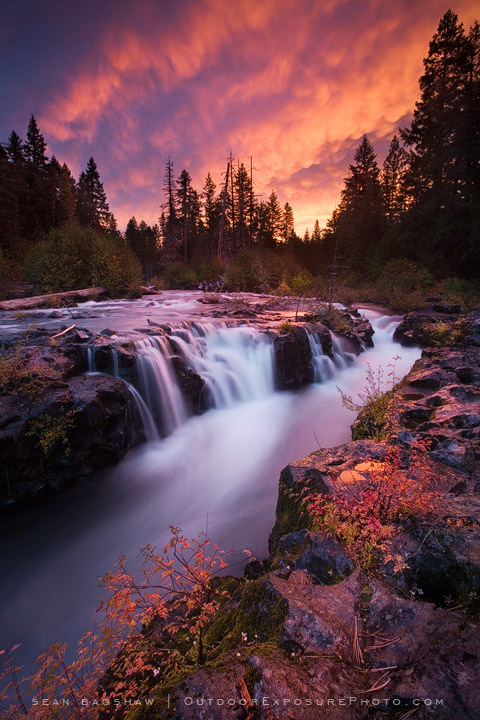 Before the Photo Cascadia group takes a short break for the holiday season, we’d like to share a few photos of our favorite waterfalls from around this region called Cascadia. Zack: Wahclella Falls has been a favorite of mine since I was a teenager. It’s not nearly as crowded as some of the more popular trails, and it’s one of the most beautiful falls in the Columbia River Gorge. I particularly like the view from up high, but there are a couple other good vantage points as well. Zack: My favorite waterfall in the Gorge is Fairy Falls. It’s also my favorite teaching spot in the Gorge. It’s the best example of how slow-shutter speed affects the look of an image—and you can zoom in for many abstract compositions of the falls. It’s a steep (but relatively short) hike up Wahkeena Creek, but definitely worth the effort. 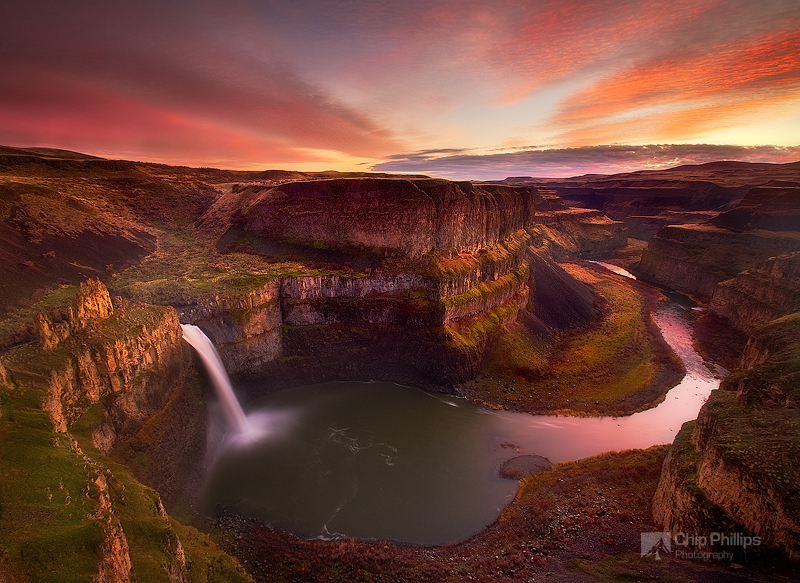 Chip: “Palouse Falls Sunset” is my title for this dramatic sunset sky over Palouse Falls in eastern Washington State. 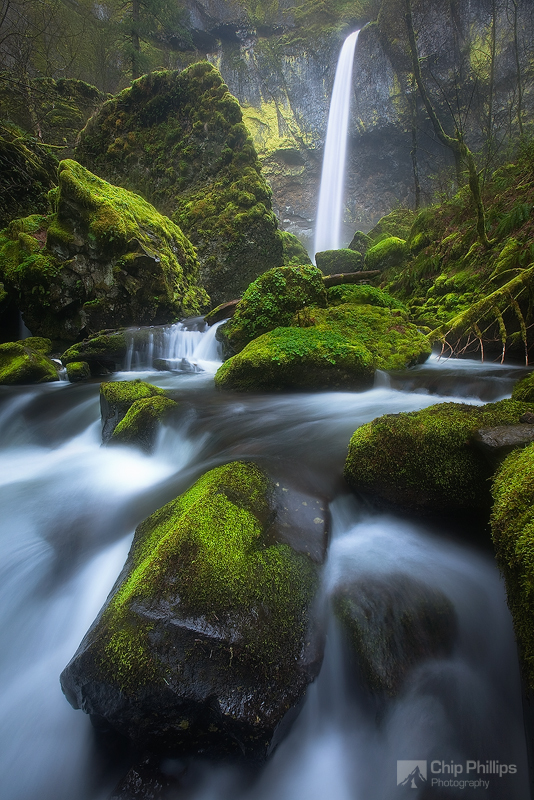 Chip: “Mossy Elowah” is the title for this misty capture of one of my favorite waterfalls in the Columbia River Gorge in Oregon. 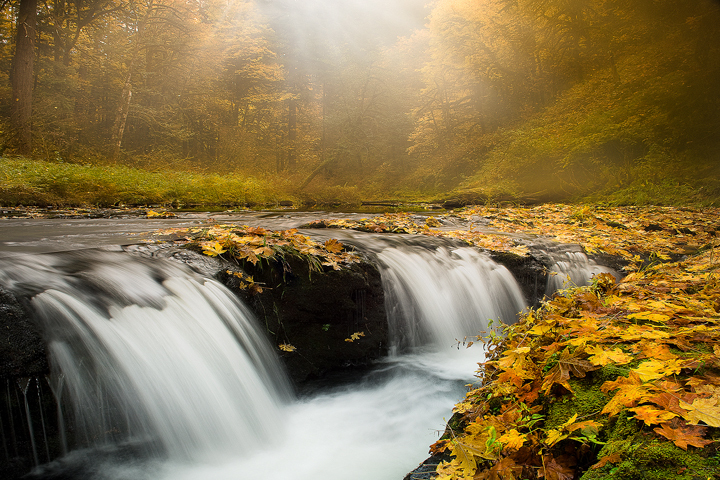 Kevin: This foggy-day photo was taken in autumn at Silver Falls State Park in Oregon. I had seen this waterfall before and it can be difficult to shoot in terms of composition. Positioning myself at the vantage point seen here in this photo was somewhat dangerous, but it was worth it. I was also lucky to be there just as the sun was breaking through. Kevin: Myrtle Falls is an iconic waterfall located in Washington’s Mount Rainier National Park in the Paradise area. 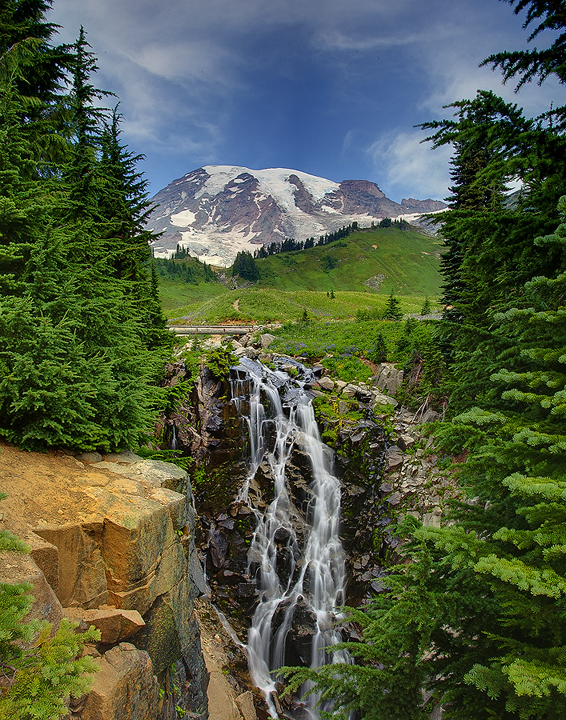 I like this waterfall because it shows the majesty of Mount Rainier and its surroundings. To get this photo I had to stitch two images vertically to better capture depth and sharpness. 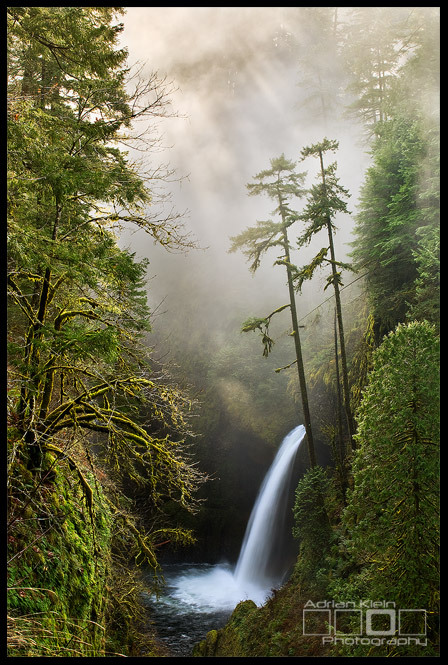 Adrian: “Enchanted” is the title for this image of Metlako Falls in the Columbia River Gorge on a chilly still winter morning as sunlight pierces its way through the thick fog. I have photographed this scene many times with only fog, but this was the first time I was able to include sunbeams. It’s one of my favorite Gorge photos. 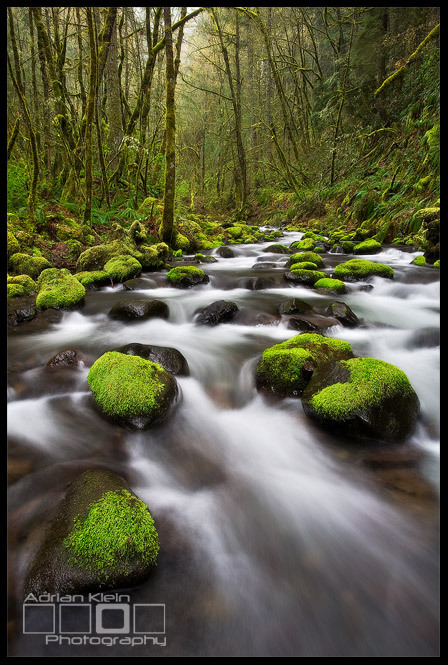 Adrian: “Forest Rain” is the title to this Columbia River Gorge shot of Gorton Creek in the cold spring rain. For me, it’s not only the flow of the image that works (pun intended), but also the falling rain. It adds additional mood and feeling to the scene that would not be there otherwise. 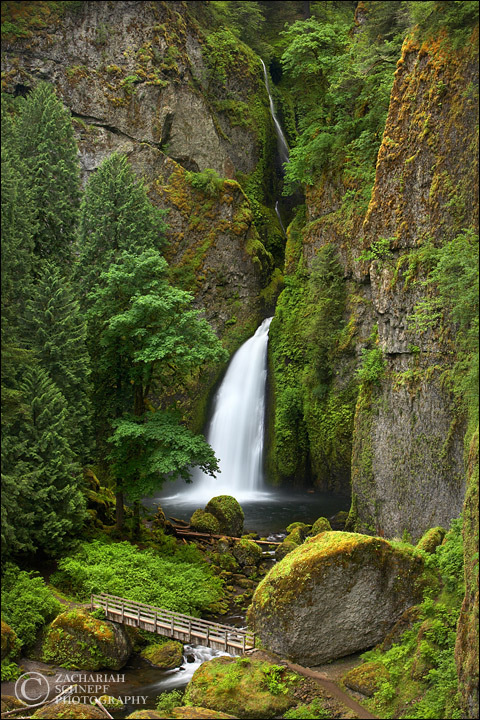 David: I loved photographing Outlet falls along the Klickitat River of southern Washington, because it is so dramatic and remote. There is no “official” parking area for this falls and no directional sign. A steep descent gets you to the bottom of the canyon, and some added fall color brings out the best in these falls. 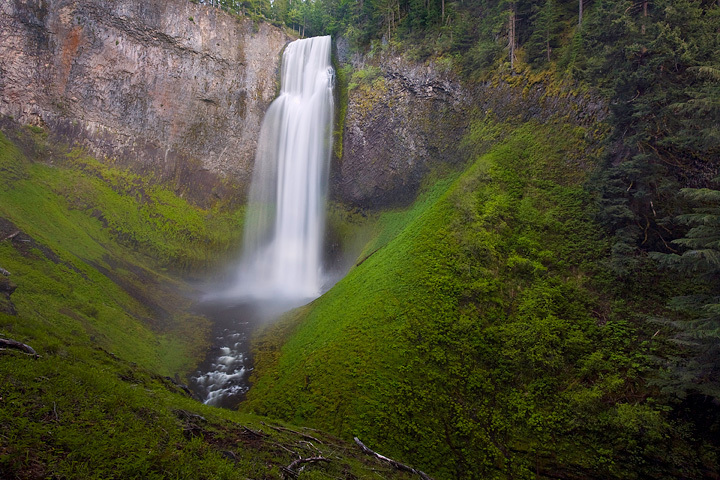 David: Salt Creek Falls is another favorite of mine, located in southern Oregon in the midst of the Cascade Range. There are a few view points for this waterfall, but I prefer a bushwhack to the bottom for this front-on view. 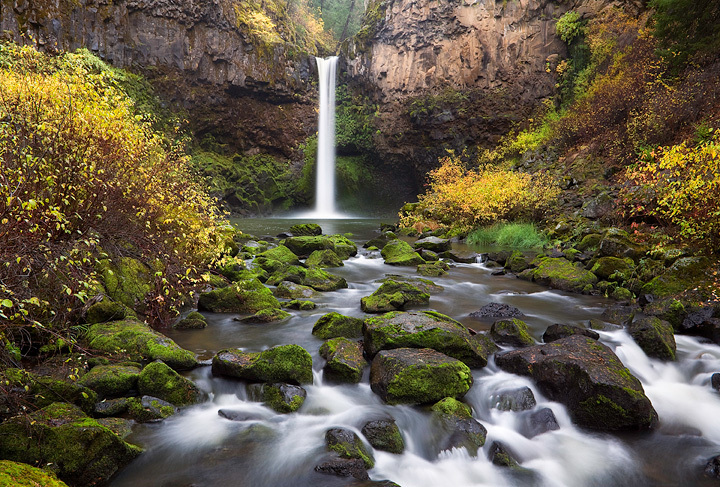 Sean: Since I’m based out of Ashland, Oregon that means I don’t have the quick access to the well-known waterfalls of Silver Falls State Park and the Columbia Gorge that the guys from the north do. While the waterfalls of the southern rivers, the Rogue, and the Umpqua aren’t as numerous or as grand, there are still some very beautiful cascades. Best of all, there aren’t the crowds of people that you get in the upper part of the state. Near Union Creek on Hwy 62, the Rogue River spills into the narrows of the Rouge Gorge in a series of rapids and short drops, with one final big plunge. I love photographing at this Gorge because there is a lot to see in a condensed area. Over time, the river has carved a deep channel in the volcanic basalt and connected a series of lava tubes to create the gorge. The resulting eroded rock formations make excellent foreground elements. At the top of the gorge, the river fans out over the basalt and spills into the narrow chute in multiple locations. There are many different compositions that can be made from various spots along the rock shelf next to the river. Light at the Rogue Gorge can be challenging, and I waited several years to get my chance to be there during this spectacular sunrise. The bright red and orange sky shed a warm glow across the entire scene and completely transformed it. Using a polarizer helped cut reflections and saturate the color on the rocks. I don’t know if I’ll ever get another chance to photograph the Rogue Gorge with light like that, but that one experience is etched in my memory. 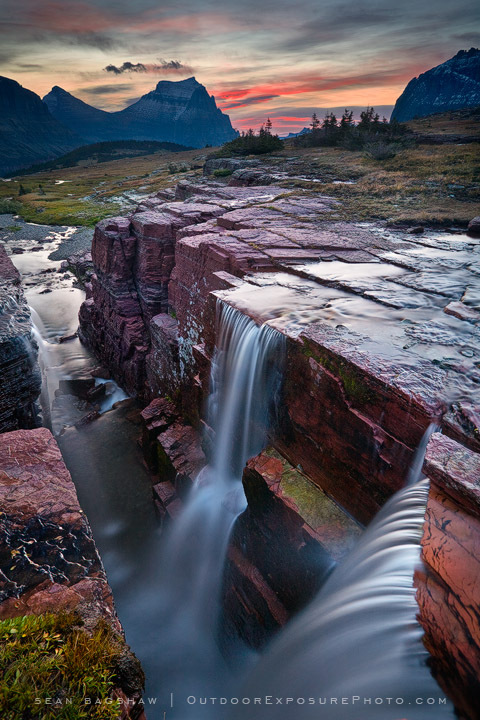 Sean: Another favorite waterfall of mine is Triple Falls in Montana’s Glacier National Park. I first became aware of this falls from Galen Rowell’s iconic image of it. In a high alpine bowl, several small creeks converge and drop over the edges of a narrow canyon carved out of the red stone commonly found in Glacier. With sheer Rocky Mountain peaks as a backdrop, it is a uniquely beautiful natural formation. The falls isn’t located on a trail, nor is it marked on any maps that I have seen. In order to reach it by sunrise requires a cross-country hike through grizzly country in the dark. The day we photographed it, David Cobb and I walked cautiously through the pre-dawn gloom. We stuck to patches of snow and exposed rock so as not to walk on the delicate alpine foliage. We were sure that every boulder and bush along the way was a bear. We arrived just before sunrise and prepared for the light to come. Earlier in the summer when the snow is melting, there are three distinct waterfalls that plunge into the canyon. When I photographed it in the autumn, one of the falls was nothing more than a trickle so my image is titled “Double Falls.” The stormy sky that morning added shadowy dramatic light to the scene. At that time of day, the sky was so much brighter than the depths of the canyon that two exposures needed to be blended in order to contain the wide dynamic range. 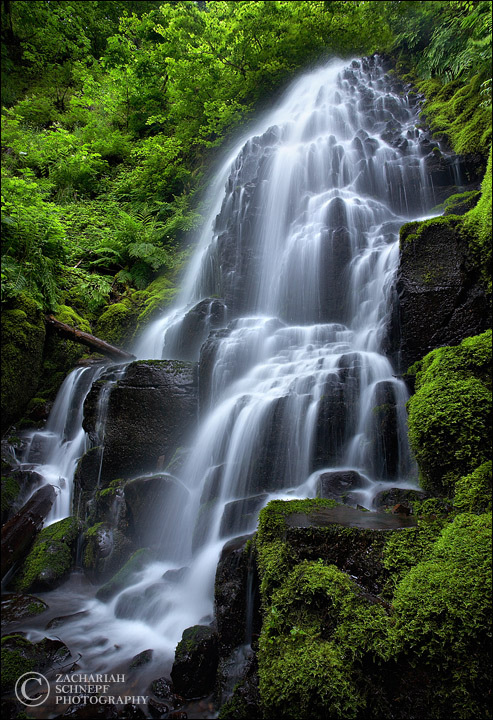 There you have it, a few of our favorite waterfalls from Cascadia. We’ll be back with more blogs and information in the New Year, so until then have a happy Holiday season, from all of us at Photo Cascadia. ~ by photocascadia on December 18, 2010. Great photos!! Some of my favorite falls as well!! Thank you for sharing a new perspective on falls known to me and many new to me. The composition of these photos is amazing. Once again thanks for sharing. Enjoy your holiday break. Have a good holiday guys… and the best in 2011!. Supurb images! You guys all rock! Thank you for some of the best NEW and CREATIVE photography I’ve seen in a long time! Absolutely incredible! These photos make me want to run, walk or crawl as fast as I can to see some of those places in person. Thanks you for sharing your talents with us. Wow, what a stunning tour of all these waterfalls in the NW! It was great to see such spectacular views of places I might not ever get to see in person. very nice shots everyone, my favorite and the one I would really like to shoot is the triple falls in Glacier NP and now that I know it is not on any map or trail I know most photographers don’t like to share hidden jems like that so I will just have to admir looking at it.